The Final in the September CPT Punta Cana online satellite tournament series at Intertops Poker and Juicy Stakes Poker is this Sunday at 2:00 Eastern Time. If you haven't won your way to that table you can buy in for $100 + $10. 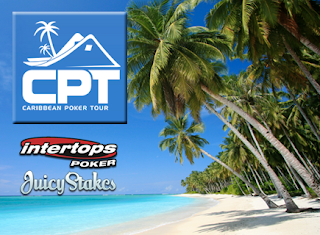 The winner on Sunday gets a $4000 prize package that includes buy-in for the CPT Punta Cana Main Event and accommodation at the all inclusive Hard Rock Hotel and Casino. I'll be joining Sunday's winner and five other online satellite winners in the Dominican Republic in November! There's one more CPT satellite series beginning September 23. Buy-in at any point in the 3-tier tournament. Step 1 tournaments ($2.00 + $.20) are held daily at 14:00, 17:00, 20:00, 23:00 and 02:00 GMT in both poker rooms. 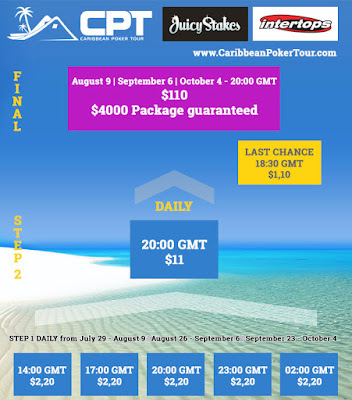 The Final where the last $4000 CPT Punta Cana prize package will be awarded, will be October 4th. Read about some of the online winners that have already won their way to the Caribbean on this poker player blog. See you in Punta Cana? !